On a recent trip to South Jersey, we forwent the busy restaurants at The Pier and elected to head over to Somers Point. We ventured over to Charlie’s for dinner. A local watering hole since 1944, they were packed. Our host had called ahead of time to reserve a table, so we only had a 5 minute wait when we arrived despite the crowd that was in watching college basketball. Calling ahead is definitely recommended on a Saturday night, even off-season. 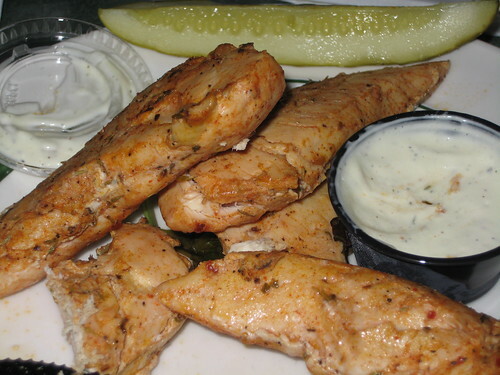 Charlie’s is known for their Boneless Breast Tenders (BBTs). Lightly breaded and doused in a variety of sauces (BBQ, garlic, spicy buffalo), they’re fantastic for snacking or as a meal themselves. Opting for something untried and a little less greasy I went with the Jamaican BBTs ($6.99), which appear to baked naked. Very juicy and flavorful, but not as spiced as I would have liked. To be fair, rarely do advertised jerk-seasoned dishes live up to my expectations. I think I’d return to their breaded cousins next time. 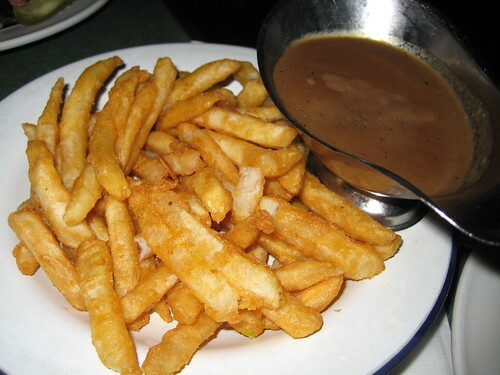 And why I bothered avoiding the grease, I’m not sure, because I also ordered Brown Gravy Fries ($3.25). Probably some of the best battered fries I’ve had in a long time, they were crispy on the outside and melting on the inside. The gravy went really well, too. Not a full meal, but close to it. Service was quick, even with our table of eight. Our server was quick to bring lots of silverware, condiments, and pitchers of water for the whole table, rather than have to refill us continually. I found prices across the board to be very reasonable considering the quality and quantity of food. I’ve got a lot of respect to cash-only businesses, especially ones that have been doing it forever. It means they’ve got something that’s worth the minor inconvenience, since the clientele keeps coming back. At Charlie’s, it’s not hard to see why they’re still around. There aren’t too many times I’ve wanted to go to New Jersey, but this sounds really good. Mike: Yes yes, sir, I’m back. There’s all sorts of good eats in Jersey. Stuff that rivals Philly. Truth.